Boltguns, Bashers and Brushes: Thing a Day 2/14/11 Toy Time! Thing a Day 2/14/11 New toys! Thing a day, Cupid edition. So with last week, (kind of non productive) behind me, I spent my Valentines with the lady friend and family, and whats the best way? Spend time together and stealthily get a few more hobby tools and toys to boot! More info after the jump. This weekend we went through and organized a few things at home, and I took the opportunity to grab a few new tools, when my Fiancée came to me and said, "Honey, there's a toy I want...It's called a die cutter." Of course, it's a crafty fabric and paper tool, but it always gets my wheels turning. Maybe I can use it with plastic? Additionally, I had a few ideas regarding plasticard trim and vehicle bling, so I did some digging and found a few new tools for myself. 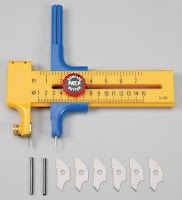 A balsa stripper and a circle cutter. The only thing that was out of my wheelhouse was the die cutter, so, in proper nerd fashion, I hit the Internet and did some research. If you have a significant other that is crafty like mine, you'll see lots of little tools they use that can be adapted to our hobby. Crazy Girly tool? Or Awesome modeling Gem? We ended up going to Joannes, as they currently had a sale on the tool. (Convenient, as it shows how my little lady is sneaky too and did her own research to strike while the iron is hot...or when the tools are cheap) They aren't cheap and we got a cutter for about 60 bucks (On sale! ), with a few sets of dies for a total of about 100 bucks. Now, of course this is my lady friends doing, and she has plenty of plans for it. most die cutters are used to cut shapes and designs out of and into paper, but the one we ended up with was aimed at cutting fabric and felt. When we got it home, Miss Thing did plenty of tests on fabric and felt and our office was filled with her child like giggles, so I of course tried it with plastic, and lo and behold, it works like a charm. It is essentially a giant crank vise that sandwiches your material under a bladed/sharpish die that squishes down with even pressure onto your material, essentially cutting it out with the turn of a crank. Just think of it as a large hole punch with multiple patters via interchangeable dies.With this tool you can cut shapes and patterns, but as lots of the dies available are girly and fancy, geometric shapes are good for me and I am currently looking for a Gothic font die as well, about 1/2 to 3/4 inch high lettering...for obvious reasons. The selling point on the Sizzix over the popular Cricut, is the fact it can do thicker materials and can use pretty much any die of that type regardless of manufacturer. I will be experimenting with it soon and posting some results. I'm thinking primarily terrain, vehicles and sculpting applications...Win Win! Secondly, I did get a few specialty tools just for me as well. In looking into adding bling to my Land raider, similar to the Calgar style Land Raider on this thread on Librarium I looked into a few specialty tools. Balsa Stripper. 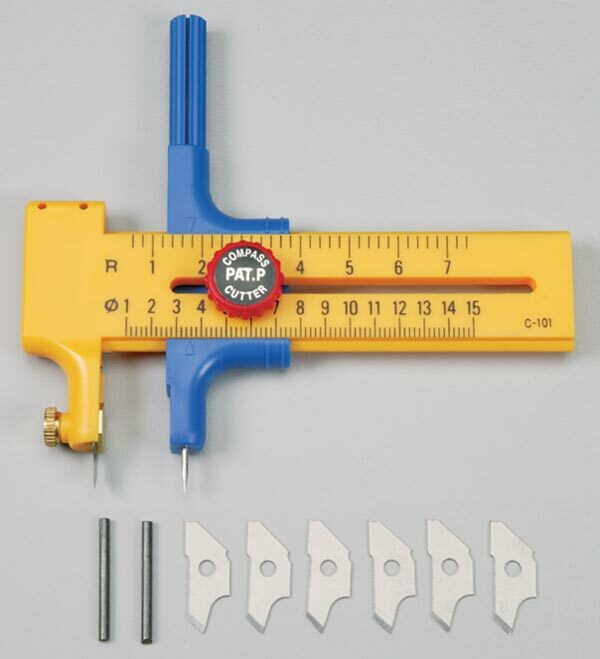 This tool is used primarily for balsa airplane, boat, and train modelers. 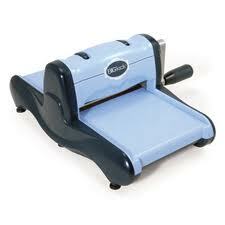 This can be used to cut even strips of Plasticard super fast and easy. Perfect for adding those armor plates and strips for edging. Circle cutter. 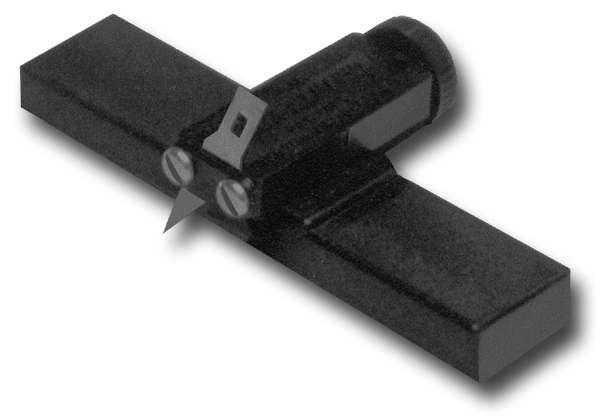 Essentially a Compass with a blade on it, but it has some very precise measurements. And lastly, a bit of a whim tool, a Sculpey Clay Conditioning tool. 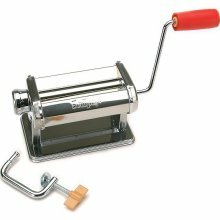 In other words a roller/flattener for small modeling and baking clays. This tools use is pretty obvious as it can help me flatten out and evenly create greenstuff sheets of varying thicknesses. I plan to use this for adding decoration, adding cloaks, and adding armor embellishments similar to the ideas presented by Scibor here. So yeah, with Valentine's Day over, I still got some hobby stuff in and added a few tools to the pile. Exciting! I hope you all had a happy Valentines day, and enjoyed the company of others for a bit.